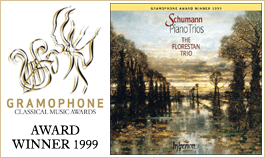 The Florestan Trio now turns its attention to Schumann's Piano Trios. These two works, Opp 63 and 80, were composed in rapid succession in the summer and autumn of 1847, some five years after the prolific year when Schumann composed most of his large-scale chamber works. The Florestan Trio's earlier CDs, of Dvořák Piano Trios and the complete Brahms Trios, received outstanding praise; this disc is sure to do the same. Schumann composed most of his large-scale chamber works in the single year 1842. His three string quartets, the well known Piano Quintet, Op 44, and the Piano Quartet, Op 47, were all written at this time; and right at the end of the year came the first of his works for piano trio – a set of four Fantasy Pieces, Op 88. Immediately before beginning this last project, Schumann noted in his diary the words ‘Trio by Mendelssohn’. On its publication two years earlier, he had hailed Mendelssohn’s D minor Trio, Op 49, as ‘the master-trio of the age’; and he may have been spurred on by Mendelssohn’s example to try his own hand at a series of similarly-scored pieces. Musically speaking, however, the Fantasy Pieces have little in common with Mendelssohn’s work, and it is more tempting to discern the influence of that composer in the first of Schumann’s ‘official’ piano trios, Op 63. Not only does this later work share its key of D minor with the Mendelssohn, but its opening movement similarly plunges, almost as though in medias res, into an atmosphere of extreme turbulence. The two piano trios Opp 63 and 80 were composed in rapid succession, in the summer and autumn of 1847. Two external stimuli may have prompted him to return to chamber music after a gap of five years. (His only chamber work in the intervening period had been the Andante and Variations for two pianos, two cellos and horn; though since this was composed in the early weeks of 1843, it may be regarded as an extension of Schumann’s concentration on chamber music the previous year.) One stimulus was the fact the Clara Schumann had recently completed her Piano Trio in G minor, the other, the intense contrapuntal studies which she and her husband had carried out in 1845. In that year, Schumann composed a set of four fugues for piano, Op 72, as well as six organ fugues on B-A-C-H and the strikingly beautiful Canonic Studies for pedal-piano, Op 58. There can be no doubt that this contrapuntal activity left its mark on the intricate part-writing of the two piano trios of 1847. Schumann brings his contrapuntal art into play from the very start of the D minor Trio, Op 63, where we find that the opening notes of the violin’s impassioned theme are accompanied in the bass of the piano by what will be the melody’s second bar. (Those who complain that Schumann’s themes are unvaryingly four-square should note the extreme irregularity of this seven-bar melody.) ‘With energy and passion’ is Schumann’s indication for the first movement; and the sinuous main theme uncoils quietly out of the violin’s lowest register, against a swirling piano part, with a wonderful sense of subdued drama. Throughout the movement, in fact, the music’s breathless agitation is conveyed not by forcefulness (for all its restlessness, this is a piece which rises to fortissimo only for one brief moment during its coda), but by its extreme compression. No sooner has the opening melody reached its climax than it subsides in an expressive turn-like phrase on the violin, and the lyrical second subject opens up. This chromatic new theme is characteristically given out in canon, and its continuation introduces the first theme as a counter-subject on the cello. Nor, in the bars leading to the repeat of the exposition, does Schumann fail to show that the first subject itself can be treated canonically. Having been unusually condensed in the exposition, Schumann is correspondingly broad at the centre of the movement. The expansion is achieved largely by means of an extraordinary moment of stasis which introduces not only a new theme, but also a strikingly original sonority. The violin and cello, both playing near the bridge of the instrument, produce that strange ‘glassy’ sound so beloved of twentieth-century composers, while the piano accompanies with shimmering chords right at the top of the keyboard, played with the soft pedal. Many of Schumann’s opening movements feature a marked change in mood and atmosphere at a parallel point – the Piano Concerto and the C major piano Fantasy, Op 17, provide familiar examples – but none does so to more startling effect than this. The new theme is one that dominates the remainder of this portion of the movement, and Schumann alludes to it again during the coda. The scherzo-like second movement provides a striking instance of Schumann’s ability to unify apparently contrasting material. Nothing could seem more different from the driving dotted rhythm of the scherzo’s main motif than the smoothly rising and falling theme of the trio; and yet they both emanate from the same melodic line. 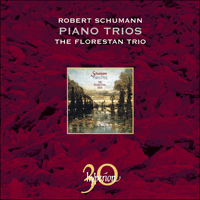 The trio’s theme itself offers another example of Schumann’s fascination with canonic writing. Perhaps this explains why he ultimately rejected the intricate counterpoint of a projected second trio which would have lent the movement as a whole a much larger five-part form. Together with his C major Symphony No 2, the D minor Trio belonged, as Schumann admitted, to a ‘time of gloomy moods’; and its slow movement is one of his great tragic utterances. There is a sense of world-weariness about the music here, engendered not only by the slowly resolving suspensions of the piano part, deep in the low register of the instrument, but also by the drooping phrases of the violin’s quietly rhapsodic melody. This sombre opening portion of the piece contains the seeds of the more flowing middle section. A phrase played by the violin in triplets shortly before the cello’s first entry foreshadows one of the middle section’s two main ideas; while a rising scale figure on the cello provides the germ for the other. The change from minor to major for this central portion of the piece is one that serves only to increase the music’s sense of yearning; and it is only with the turn to the tonic major for the relatively uncomplicated finale, which follows without a pause, that the tension is ultimately resolved in a joyous affirmation of faith. The second of Schumann’s two 1847 piano trios could hardly be more different. It is a work which, as the composer himself said, ‘makes a friendlier and more immediate impression’. Once again Schumann demonstrates his mastery of unity in diversity: the opening movement’s quiet second subject, although it sounds utterly new, is simply a rhythmic variant of the energetic main theme. A staccato idea in the piano which follows it, with strategically placed accents highlighting a sequence of descending thirds, will provide the basis for some intensely contrapuntal argument in the development section; but before it can do so, Schumann introduces a broad new melody – an unmistakable quotation of the song Dein Bildnis wunderselig, from his Eichendorff Liederkreis, Op 39. The melody arises out of an important subsidiary motif which bridges the movement’s two main themes, and Schumann points up the relationship between the two ideas much later on, in the coda. The function of the relaxed song theme at this early stage is to offset the rigorous counterpoint of the section that follows where the staccato idea, with its descending thirds neatly picked out as a counter-subject, is treated in close imitation, both in its original form and in inversion. No less song-like than the opening movement’s Eichendorff quotation is the long, inspired melody that unfolds in the opening page of the slow movement. Schumann had apparently intended to incorporate a further specific reference to the Eichendorff theme here, though in view of the prominence it has already assumed in the opening movement it was no doubt wise of him to abandon the idea. All the same, the descending shape of the slow movement’s melody provides an oblique reference to the earlier theme. The main melodic line in the opening bars lies in the violin part; but we may note that the cello and the piano play a long-sustained canon, and that the chromatically rising phrase with which the canon begins is one that will assume great importance in the further progress of the piece. Schumann’s dictum that ‘the best fugue will always be the one that the public takes – for a Strauss waltz; in other words, where the artistic roots are covered as are those of a flower, so that we only perceive the blossom’ is one that could well apply not only to the artless counterpoint of his slow movement, but also to the intermezzo-like third movement, whose sighing theme is given out in canon throughout. The figuration of the more flowing middle section is taken over into the first half of the reprise, before a coda binds the two parts of the piece together. The finale appears to take its point of departure from the flowing lines of the previous movement’s middle section, too. The entire piece draws its material from the three main constituents of its opening theme: the sinuous legato phrases with which the piano launches the piece; the staccato idea with which the cello responds, and which – as with the similar motif in the opening movement of the D minor Trio – will provide the basis for some close-knit imitative writing later on; and the first assertive phrase on the violin, which returns to form an important secondary theme. This last idea is reiterated over and over again in the coda, to bring the work to a close in an atmosphere of mounting excitement. With this exhilarating piece behind him, Schumann could press on with the large-scale project he had interrupted in order to write his two piano trios – the opera Genoveva. Schumann composa l’essentiel de ses œuvres de chambre à grande échelle dans la seule année 1842. Ses trois quatuors à cordes, son célèbre Quintette avec piano, op.44 et son Quatuor avec piano, op.47 datent tous de cette époque; et la toute fin de l’année 1842 le vit commencer la première de ses œuvres pour trio avec piano – un corpus de quatre Phantasiestücke, op.88. Juste avant d’entreprendre ce dernier projet, Schumann nota dans son journal les mots «Trio de Mendelssohn». A sa publication en 1840, il avait salué le Trio en ré mineur, op.49 de Mendelssohn comme le «trio maître de l’époque»; et peut-être l’exemple de Mendelssohn l’a-t-il incité à s’essayer à une série de pièces instrumentées à l’identique. Musicalement parlant, cependant, les Phantasiestücke ont peu en commun avec l’œuvre de Mendelssohn, dont il est plus tentant de discerner l’influence dans le premier des trios avec piano «officiels» de Schumann, op.63 – lequel est non seulement en ré mineur, mais voit son mouvement d’ouverture plonger, presque comme in medias res, dans une atmosphère d’extrême turbulence. Les deux trios avec piano opp. 63 et 80 furent composés coup sur coup, durant l’été et l’automne 1847. Deux événements extérieurs ont pu le pousser à revenir à la musique de chambre au bout de cinq ans (au cours desquels sa seule œuvre de chambre fut l’Andante et Variations pour deux pianos, deux violoncelles et cor; mais cette œuvre, écrite dans les premières semaines de 1843, peut être considérée comme un prolongement de la concentration de Schumann sur la musique de chambre, en 1842). D’une part, Clara Schumann avait récemment achevé son Trio avec piano en sol mineur; d’autre part, elle avait effectué, avec son mari, d’intenses études contrapuntiques, en 1845. Cette année-là, Schumann composa un corpus de quatre fugues pour piano, op.72, ainsi que six fugues pour orgue sur B-A-C-H et les remarquablement belles Études canoniques pour piano avec pédalier, op.58. Nul doute que cette activité contrapuntique laissa son empreinte sur la complexe conduite des parties des deux trios avec piano de 1847. Dès le tout début du Trio en ré mineur, op.63, Schumann exerce son art contrapuntique, et nous découvrons que les notes initiales du thème violonistique passionné sont accompagnées, à la basse du piano, par ce qui sera la deuxième mesure de la mélodie. (Ceux qui se plaignent du caractère invariablement carré des thèmes de Schumann devraient noter l’extrême irrégularité de cette mélodie de sept mesures.) «Avec énergie et souffrance», telle est l’indication de Schumann pour le premier mouvement; et le sinueux thème principal se déroule paisiblement à partir du registre le plus grave du violon, contre une partie de piano tournoyante, avec un merveilleux sens du drame contenu. Tout au long du mouvement, en réalité, l’agitation haletante de la musique est véhiculée non par sa puissance (malgré toute son agitation, cette pièce ne s’élève au fortissimo que pendant un court instant de sa coda), mais par son extrême compression. La mélodie d’ouverture n’a pas plutôt atteint à son apogée qu’elle s’évanouit en une phrase expressive au violon et que le lyrique second sujet se déploie. Ce nouveau thème chromatique est caractéristiquement énoncé en canon, et sa continuation introduit le premier thème comme contre-sujet au violoncelle. Schumann ne manque pas non plus, dans les mesures menant à la reprise de l’exposition, de prouver que le premier sujet lui-même peut-être traité canoniquement. S’étant montré inhabituellement condensé dans l’exposition, Schumann est ample au centre du mouvement. L’expansion résulte en grande partie d’un extraordinaire moment de tranquillité, qui introduit un nouveau thème, mais aussi une sonorité d’une originalité saisissante. Le violon et le violoncelle, jouant tous deux sul ponticello, produisent cette étrange sonorité «lisse» tant aimée des compositeurs du XXe siècle, tandis que le piano les accompagne de scintillants accords à l’extrême haut du clavier, exécutés à l’aide de la pédale douce. Nombre des mouvements d’ouverture de Schumann présentent, à ce même moment, un changement marqué d’humeur et d’atmosphère – tels le Concerto pour piano et la Fantaisie pour piano en ut majeur, op.17 –, mais aucun ne provoque un effet plus saisissant que celui-ci. Le nouveau thème domine le reste de cette portion du mouvement, et Schumann y refait allusion dans la coda. Le deuxième mouvement, de type scherzo, offre un exemple frappant de la capacité de Schumann à unifier un matériau apparemment contrasté. Rien ne saurait sembler plus différent du rythme pointé battant du motif principal du scherzo que le thème doucement ascendant et descendant du trio; et pourtant, tous deux émanent de la même ligne mélodique. Le thème même du trio offre un autre exemple de la fascination de Schumann pour l’écriture canonique. Et peut-être cela explique-t-il pourquoi le compositeur rejeta finalement le contrepoint complexe d’un projet de second trio, qui aurait globalement donné au mouvement une forme beaucoup plus vaste, à cinq parties. Avec la Symphonie no2 en ut majeur, le Trio en ré mineur appartient, comme le reconnut Schumann, à une «époque d’humeurs sombres»; et le mouvement lent de ce trio constitue l’une des grandes énonciations tragiques du compositeur. La musique recèle ici un sentiment de lassitude du monde, engendré et par les retards se résolvant doucement de la partie de piano, bas dans le registre grave de l’instrument, et par les phrases affaissées de la mélodie violonistique paisiblement rhapsodique. Cette sombre portion d’ouverture contient les graines de la section centrale plus fluide. Une phrase jouée par le violon en triolets, peu avant la première entrée du violoncelle, présage l’une des deux idées principales de la section centrale – une figure en gammes ascendante, au violoncelle, fournissant le germe de l’autre idée. Le passage de mineur à majeur pour cette portion centrale de la pièce ne sert qu’à exacerber le sentiment de désir ardent de la musique; et ce n’est qu’avec le passage au majeur de la tonique, pour le finale relativement simple, qui suit immédiatement, que la tension est finalement résolue en une joyeuse affirmation de foi. Le second des deux trios avec piano composés par Schumann en 1847 ne saurait guère davantage différer du premier. Il s’agit d’une œuvre qui, pour reprendre les mots du compositeur, «fait une impression plus amène et plus immédiate». Une fois encore, Schumann démontre sa maîtrise de l’unité dans la diversité: le paisible second sujet du mouvement d’ouverture, quoique semblant profondément nouveau, est une simple variante rythmique de l’énergique thème principal. S’ensuit une idée staccato au piano – où des accents stratégiquement placés rehaussent une séquence de tierces descendantes –, qui fournira la base de quelque argument intensément contrapuntique dans la section de développement; mais avant que cela ne puisse se faire, Schumann introduit une nouvelle mélodie ample – indéniable citation du lied Dein Bildnis wunderselig, extrait de son Liederkreis sur des poèmes d’Eichendorff, op.39. La mélodie naît d’un important motif subsidiaire, qui jette un pont sur les deux thèmes principaux du mouvement, et Schumann fait ressortir la relation entre les deux idées beaucoup plus tard, dans la coda. La fonction du thème du lied, détendu, est, en cette étape précoce, de contrebalancer le contrepoint rigoureux de la section suivante, où l’idée staccato, avec ses tierces descendantes nettement identifiées comme contre-sujet, est traitée en imitation serrée, tant dans sa forme originale que dans son inversion. Non moins de type lied que la citation d’Eichendorff du mouvement d’ouverture est la longue mélodie inspirée qui se déploie dans la page initiale du mouvement lent. Schumann avait apparemment l’intention d’incorporer ici une autre référence spécifique au thème d’Eichendorff, mais eut la sagesse d’y renoncer – eu égard à la proéminence de ce thème dans le mouvement d’ouverture. Il n’ en demeure pas moins que la forme descendante de la mélodie du mouvement lent constitue une référence indirecte au thème antérieur. La ligne mélodique principale, dans les mesures d’ouverture, repose dans la partie de violon; mais nous pourrions noter que le violoncelle et le piano jouent un canon tenu, et que la phrase chromatiquement ascendante avec laquelle ce canon commence assumera une grande importance dans la progression ultérieure de la pièce. La maxime de Schumann selon laquelle «la meilleure fugue sera toujours celle que le public prend … pour une valse de Strauss; autrement dit, lorsque les racines artistiques sont couvertes comme les racines d’une plante, de sorte que nous ne percevons que la fleur» pourrait s’appliquer aussi bien au contrepoint ingénu de son mouvement lent qu’au troisième mouvement de type intermezzo, dont le thème murmurant est énoncé en canon de bout en bout. La figuration de la section centrale, plus fluide, revient dans la première moitié de la reprise, avant qu’une coda ne lie les deux parties de la pièce. Le finale semble, lui aussi, prendre son point de départ dans les lignes fluides de la section centrale du mouvement précédent. Toute la pièce tire son matériau des trois grandes composantes du thème d’ouverture: les sinueuses phrases legato avec lesquelles le piano lance la pièce; l’idée staccato avec laquelle le violoncelle répond, et qui – à l’ instar du motif similaire dans le mouvement d’ouverture du Trio en ré mineur – servira de base à quelque écriture imitative très serrée; enfin, la première phrase affirmative au violon, qui revient pour former un important thème secondaire. Cette dernière idée est réitérée encore et encore dans la coda, afin d’amener l’œuvre à sa conclusion dans une atmosphère d’animation croissante. Cette œuvre exaltante achevée, Schumann put poursuivre le projet à grande échelle qu’il avait interrompu pour écrire ses deux trios avec piano: l’opéra Genoveva. Schumann hat die meisten seiner großangelegten Kammermusikwerke in einem einzigen Jahr, nämlich 1842 komponiert. Seine drei Streichquartette, das bekannte Klavierquintett op. 44 und das Klavierquartett op. 47 sind alle um diese Zeit entstanden, und ganz am Ende des Jahres kamen die ersten Werke für Klaviertrio heraus – die vier Phantasiestücke op. 88. Kurz bevor er die Arbeit an diesem Projekt aufnahm, notierte Schumann in seinem Tagebuch „Trio von Mendelssohn“. Bei dessen Veröffentlichung zwei Jahre zuvor hatte er Mendelssohns d-Moll-Trio op. 49 als Meistertrio der Epoche gepriesen, und es wäre möglich, daß er sich von Mendelssohns Vorbild anspornen ließ, eine Folge ähnlich besetzter Stücke in Angriff zu nehmen. Musikalisch haben die Phantasiestücke jedoch wenig gemeinsam mit Mendelssohns Werk, und man ist viel eher versucht, den Einfluß des Komponisten in op. 63 auszumachen, dem ersten „offíziellen“ Klaviertrio Schumanns. Nicht nur hat dieses spätere Werk die gleiche Tonart (d-Moll) wie das von Mendelssohn, sondern der erste Satz taucht auf ähnliche Art – sozusagen in medias res – in eine extrem turbulente Atmosphäre ein. Schumann komponierte seine beiden Klaviertrios op. 63 und 80 in rascher Folge im Sommer und Herbst 1847. Zwei äußere Anreize könnten ihn damals veranlaßt haben, sich nach fünfjähriger Unterbrechung erneut der Kammermusik zuzuwenden. (Sein einziges Kammermusikwerk aus der dazwischenliegenden Zeit trägt den Titel Andante und Variationen und ist für zwei Klaviere, zwei Celli und Horn geschrieben; da es in den ersten Wochen des Jahres 1843 entstanden ist, kann man es als weiteres Ergebnis der Konzentration Schumanns auf die Kammermusik ansehen, derer er sich im Jahr zuvor befleißigt hatte.) Ein Anreiz war die Tatsache, daß Clara Schumann vor kurzem ihr Klaviertrio in g-Moll vollendet hatte, der andere die intensiven kontrapunktischen Studien, die sie und ihr Mann 1845 unternommen hatten. In diesem Jahr komponierte Schumann die vier Klavierfugen op. 72 sowie sechs Orgelfugen über den Namen B-A-C-H und die bemerkenswert schönen Kanonischen Studien für Pedalflügel op. 58. Es kann kein Zweifel bestehen, daß sich diese Beschäftigung mit dem Kontrapunkt in der komplizierten Stimmführung der Klaviertrios von 1847 niedergeschlagen hat. Schumann bringt sein kontrapunktisches Können gleich zu Anfang des d-Moll-Trios op. 63 ins Spiel; dort nämlich stellen wir fest, daß die ersten Noten des leidenschaftlichen Violinthemas im Baß des Klaviers von einer Tonfolge begleitet werden, die zum zweiten Takt der Melodie werden wird. (All jene, die sich beklagen, daß Schumanns Themen samt und sonders allzu geradlinig seien, sollten auf die extreme Unregelmäßigkeit dieser sieben Takte langen Melodie achten.) „Mit Energie und Leidenschaft“ lautet Schumanns Angabe zum ersten Satz, und das gewundene Hauptthema schlängelt sich, untermalt von einer wirbelnden Klavierstimme, mit einem wunderbaren Gefühl unterschwelliger Dramatik ruhig aus dem tiefsten Register der Violine hervor. Den ganzen Satz hindurch wird die atemlose Erregung der Musik nicht mit Wucht vermittelt (es handelt sich bei aller Rastlosigkeit um ein Stück, das sich nur einen kurzen Augenblick lang während der Coda zum Fortissimo steigert), sondern von seiner extrem gedrängten Form. Kaum hat die einleitende Melodie ihren Höhepunkt erreicht, verklingt sie auch schon in einer expressiven, wie aus Doppelschlägen bestehenden Violinphrase, und es beginnt das lyrische zweite Subjekt. Dieses chromatische neue Thema wird typischerweise kanonisch angelegt, und seine Fortsetzung führt das erste Thema als Kontrapunkt im Cello ein. In den Takten, die zur Wiederholung der Exposition überleiten, versäumt es Schumann auch nicht, zu zeigen, daß das erste Subjekt selbst kanonisch verarbeitet werden kann. Nachdem er in der Exposition ungewöhnliche Dichte bewiesen hat, äußert sich Schumann im Mittelteil des Satzes entsprechend breit. Die Expansion wird vorwiegend durch einen außergewöhnlichen Moment der Stasis erzielt, der nicht nur ein neues Thema einführt, sondern auch eine verblüffend originelle Klangstruktur. Violine und Cello, die beide nahe am Steg spielen, erzeugen jenen seltsam „gläsernen“ Klang, der bei Komponisten des zwanzigsten Jahrhunderts so beliebt ist, während das Klavier sie mit schimmernden Akkorden vom obersten Ende der Klaviatur begleitet, die mit Dämpfer gespielt werden. Viele von Schumanns Kopfsätzen zeichnen sich an entsprechender Stelle durch einen deutlichen Wechsel der Stimmung und Atmosphäre aus – das Klavierkonzert und die Klavierfantasie in C-Dur op. 17 sind bekannte Beispiele –, aber keiner tut es mit derart erstaunlicher Wirkung wie dieser. Das neue Thema ist so geartet, daß es diesen Teil des Satzes bis zuletzt bestimmt, und Schumann spielt in der Coda erneut darauf an. Der zweite Satz im Scherzostil hat ein eindrucksvolles Beispiel für Schumanns Fähigkeit zu bieten, scheinbar kontrastierendes Material auf einen Nenner zu bringen. Nichts könnte einen größeren Gegensatz zum treibenden punktierten Rhythmus im Hauptmotiv des Scherzos bieten als das geschmeidig steigende und fallende Thema des Trios; dennoch gehen beide von der gleichen Melodielinie aus. Das Triothema hält ein weiteres Beispiel dafür bereit, wie sehr Schumann von der Möglichkeit kanonischer Stimmführung fasziniert war. Vielleicht erklärt sich daraus, warum er letztlich vom komplexen Kontrapunkt eines geplanten zweiten Trios abgesehen hat, das dem Satz insgesamt eine wesentlich umfangreichere fünfteilige Form gegeben hätte. Zusammen mit seiner C-Dur-Sinfonie Nr. 2 gehörte das Trio in d-Moll, wie Schumann gestanden hat, in eine Zeit trüber Stimmungen, und der langsame Satz des Trios ist eine seiner großen tragischen Äußerungen. Die Musik vermittelt hier ein Gefühl der Weltverdrossenheit, ausgelöst nicht nur durch die sich langsam auflösenden Vorhalte des Klavierparts im tiefsten Register des Instruments, sondern auch durch die matten Phrasen der still rhapsodischen Violinmelodie. Diese melancholische Eröffnung des Satzes enthält den Grundstock eines leichter fließenden Mittelteils. Eine Triolenphrase, die die Violine kurz vor dem ersten Einsatz des Cellos spielt, kündigt eine der beiden Hauptideen des Mittelteils an, während eine ansteigende Tonleiterfigur im Cello den Keim für die andere bereithält. Der Übergang von Moll nach Dur in diesem mittleren Satzteil dient insbesondere dazu, das Gefühl der Sehnsucht zu verstärken, das von der Musik ausgeht; und erst mit dem Wechsel zur Durtonika im ohne Pause anschließenden relativ unkomplizierten Finale wird die Spannung mit einer freudigen Bekenntnis zum Glauben endgültig abgebaut. Das zweite der beiden Klaviertrios, die Schumann 1847 komponiert hat, könnte sich von seinem Gegenstück kaum deutlicher unterscheiden. Es handelt sich um ein Werk, das nach eigenem Bekunden des Komponisten einen freundlicheren, unmittelbareren Eindruck macht. Schumann demonstriert wiederum seine meisterliche Fähigkeit, aus der Vielfalt zur Einheit zu gelangen: Das ruhige zweite Subjekt des ersten Satzes klingt zwar gänzlich neu, ist jedoch schlicht eine rhythmische Variante des forschen Hauptthemas. Eine Staccato-Idee des Klaviers, die sich anschließt und mit strategisch plazierten Akzenten eine Folge abwärts gerichteter Terzen hervorhebt, dient als Grundlage für ein gewisses Maß an eindringlich kontrapunktischer Erörterung in der Durchführung; doch Schumann führt, noch ehe es dazu kommt, eine breit angelegte neue Melodie ein – ein unverkennbares Zitat aus dem Lied Dein Bildnis wunderselig, das seinem Eichendorffschen Liederkreis op. 39 entstammt. Die Melodie geht aus einem wichtigen Nebenthema hervor, das eine Brücke zwischen den beiden Hauptthemen des Satzes schlägt, und Schumann weist einige Zeit später, nämlich in der Coda auf die Beziehung zwischen den beiden Ideen hin. Die Funktion des entspannten Liedthemas besteht in diesem frühen Stadium darin, den strengen Kontrapunkt des folgenden Abschnitts auszugleichen, in dem die Staccato-Idee, deren absteigende Terzen sauber als Gegensubjekt kenntlich gemacht sind, in enger Imitation verarbeitet wird, und zwar sowohl in ihrer ursprünglichen Form als auch in der Umkehrung. Nicht weniger liedhaft als das Eichendorff-Zitat des ersten Satzes ist die lange, einfallsreiche Melodie, die sich auf der ersten Partiturseite des langsamen Satzes entspinnt. Schumann hatte offenbar vor, hier noch einen eindeutigen Hinweis auf das Eichendorff-Thema anzubringen, doch war es in Anbetracht des Vorrangs, den es im ersten Satz beansprucht hatte, sicherlich klug von ihm, davon abzusehen. Gleichviel stellt die abwärts gerichtete Form der Melodie des langsamen Satzes einen indirekten Verweis auf das vorherige Thema dar. Die Hauptmelodielinie ist in den ersten Takten im Violinpart angesiedelt; aber wir können erkennen, daß Cello und Klavier einen lang ausgehaltenen Kanon spielen und daß die chromatisch ansteigende Phrase, mit der der Kanon beginnt, im weiteren Verlauf des Satzes erhebliche Bedeutung annehmen wird. Schumann hat gesagt: „Jedenfalls bleibt immer die die beste Fuge, die das Publicum – etwa für einen Strauß’schen Walzer hält, mit anderen Worten, wo das künstliche Wurzelwerk wie das einer Blume überdeckt ist, daß wir nur die Blüte sehen.“ Dieser Ausspruch ließe sich ohne weiteres nicht nur auf den schmucklosen Kontrapunkt seines langsamen Satzes anwenden, sondern auch auf den dritten Satz im Intermezzo-Stil, dessen seufzendes Thema durchweg im Kanon dargeboten wird. Die Figurierung des flüssigeren Mittelteils wird in die erste Hälfte der Reprise übernommen, ehe eine Coda die beiden Teile des Satzes zusammenfügt. Das Finale scheint die fließenden Linien im Mittelteil des vorangegangenen Satzes als Ausgangspunkt zu wählen. Der ganze Abschnitt bezieht sein Material aus den drei Hauptkomponenten seines einleitenden Themas: Den verschlungenen Legato-Phrasen, mit denen das Klavier den Satz in Gang bringt, dem Staccato-Motiv, mit dem das Cello antwortet und das – wie bei dem entsprechenden Motiv im ersten Satz des d-Moll-Trios – später die Grundlage für eine Passage straff imitiativer Stimmführung liefert, sowie der ersten vorgebrachten Violinphrase, die als wichtiges Nebenthema zurückkehrt. Die letztgenannte Idee wird in der Coda ein ums andere Mal wiederholt und bringt so das Werk in einer Atmosphäre wachsender Erregung zum Abschluß. Nachdem er dieses erfrischende Stück hinter sich hatte, konnte Schumann erneut das umfangreiche Projekt vorantreiben, das er unterbrochen hatte, um seine zwei Klaviertrios zu schreiben – die Oper Genoveva.